As electric unicycle are becoming more prevalent, people's requirements for them are becoming higher and higher too. Higher quality, stronger security system, more concise design and higher cost-effective have been necessary elements for people to judge whether to buy or not. To meet the market demand and enthusiasm of scooters, Fosjoas sitting-posture electric scooter U1 was born to shine scooter world. Compared to other sitting-posture two-wheel electric scooter, Fosjoas U1 is much smaller for it has no handles but a cushioned seat only. Due to humanized design and graceful posture, the seat cushion is adjustable, so riders can rise or reduce the seat height as they like. For the small size, people can ride in the street or in the park or even go through a little corridor. No matter anywhere other people will always be envious of those cool guys who are leading the trend. For the small size and practical use, Fosjoas two wheel electric scooter U1 will become more and more popular in the future. For the consideration of environmental aspect, the vehicle shell is made of technological and environmental-friendly materials, and the PC material applied to Fosjoas U1 has features as wear-resisting, scratch-resistant, insulation, extensiveness, stability and resistance to chemical corrosion. Although Fosjoas U1 has a seat cushion, people can choose various ways to ride. They can stand or sit to ride which is suitable for wider range of application scenarios, and the materials of U1 pedal features anti-knock and pressure-reducing, so that it is comfortable and safe for people to ride. Fosjoas self-balancing electric scooter U1 has the 10 inch small wheel and the unique design of exposed tyres make it have more extraordinary adaptability in outdoor environment, and the endless power just stems from this delicate small wheel. 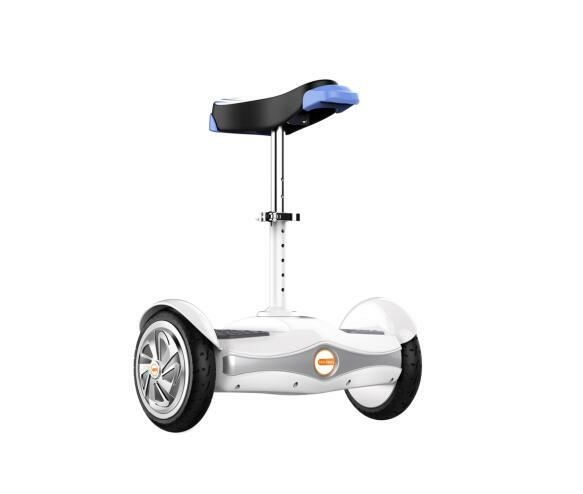 Nowadays, people can find different scooters in various kinds of TV programs, so self-balancing electric scooters are no longer the toys for some certain small group. Choice of Fosjoas U1 mini electric unicycle is definite right decision for people themselves or friends as a special gift.